Jordyn, can you briefly walk us through your story – how you started and how you got to where you are today. My story begins with the simple fact that I grew up in the beauty industry. With this, every day after school, being present inside a salon was routine. Therefore, it was early on that I retained love and passion for the beauty world. The simple fact of knowing that you have made a difference in someone’s life, by simply performing your passion, is the ultimate reward. For myself, this is why I am a Beauty Designer. Not only to reap the benefits of doing what I love, but to purely make a difference and create change in an individual’s life. These qualities alone are key to success. In a small salon in Schaumburg, Illinois is where I began as an assistant/shampoo girl to two very talented stylists. Here is where I developed the true essence of customer service and team work. During this time I balanced attending high school and working full time, both after school and during the weekends to maintain this position. Hard work began very young for me. Determination and drive to be something better the next day, than I was the current day, was an everyday physical and mental routine for me. I wanted to exist in this world, not just be. So my job was very important to me. Even if it was just an assistant position. I knew it was the foundation to the successful finale I craved. During the next few years, and after one year of college, I out grew my suburban shell and knew it was time to make my next move. The city is where I have always dreamt of performing beauty services. Therefore, change was in order. The real motivation to this move was a simple stroll one evening down Oak Street. The ‘Gold Coast’ is the ‘place to be’ and known for this famous street because of it is luxurious environment. During this walk, my then best friend and now husband, inspired me to apply to one of the salons called Salon Mor. This salon was the salon to be at during this time and almost impossible to get accepted on to the team. In my mind, for some reason I doubted my talent and thought that something like this would never be possible. The very next day I sent in my resume anyway. A week went by, no response. Then after several calls, constant persistency and consistent rejection, I decided to make true initiation and show face. Simply because failing was not a character in my story of life. Upon my arrival, I was rejected one last time and then during my exit of the salon, a miracle occurred and I heard “Wait…” Gina Mondragon/King (a well-known, highly educated, international colorist and owner of Salon Mor) acknowledged me. It was this moment that was a major stepping stone for my career. The intensive training she delivered, taught me most of what I know in order to excel as a great colorist and extensionist. Or purely, an achieved hair designer. After some time, Salon Mor closed and thereafter, I traveled to two more salons in the Gold Coast. (One of those salons closed also) And it wasn’t long until I began as a senior stylist at Saks Fifth Avenue salon. After almost two years, this salon closed as well. It didn’t take me long to seriously take into consideration opening my own salon considering this “salon closing” trend became a constant norm. I began to realize that the “big salon” idea was a wash and a boutique salon was a gold mine of an idea. During this wishful thinking, I was offered a position at the Palmer House Hilton spa to coordinate and build a team for their inexistent salon, at the time. And I did just that. As time went on, the reality of truly desiring to work for myself became a lingering thought in my mind. And one day, I literally decided to do it. Because it was time to shed my underdog shell and be the boss I was always meant to be. In true essence, to become an independent hair designer is the ultimate scare. And you must have the potential and talent to deliver on this. Salon Snob came to light in that moment. You always have to work for somebody, in order to work towards working for yourself. Anyone who doesn’t recognize this key ingredient to success, may never succeed fully. Therefore, this inconsistent and somewhat broken journey of mine, led me to the ultimate prize. My salon, Salon Snob. It felt good knowing that I was not even 25 yet and I followed through with my commitment to myself. Salon Snob is a private boutique salon that caters to one on one beauty services. With this concept, I have been able to give the ultimate client experience that is custom to each individuals beauty needs. In addition, I have branded my own lip line “LipSnob”. After much success with Salon Snob, I decided to achieve another goal of mine. And that was to create my own cosmetic line. Even though I have reached my goals of having my own successful boutique salon for almost 5 years and my very own lip line “LipSnob”, I still keep that initial drive and determination in my pocket. My modo: Always remember what it’s like to be hungry, even when your plate is full. Because there’s always something more to achieve and better that can be made out of anything. It’s not always easy as a hair designer going from working under someone to venturing out and going independent. It’s a huge risk and to be honest its very nerve racking. However, if you indefinitely believe in yourself and are faithful to your talent, then you can achieve success within being a salon owner. For me, nothing has ever come easy in my life, let alone my career. I’ve always had to work excessively, above and beyond, fighting through exhaustion some days in order to achieve what I have today. Even if that meant having more than one job outside of my passion. When I first opened my salon, now almost 5 years ago, I was a part time server at a local bowling alley. Working day in and day out, both serving and at consistently working at the salon without any days off. Because for me, it wasn’t about the money, it was about creating my brand. So I did what it took to succeed. Even if that meant spending some of my time working in a waitressing job I cared nothing about. Sometimes you have to set your ego aside to make room for all chapters in the book of your journey. Besides, I always say “There’s no shame in my game.” And with this, I utilized being a waitress as free advertisement for my salon. I was consistently meeting new people, who in return became clients of mine. In life you have to make do with that you have and appreciate everything you are given. Most of the time, those small journeys turn into big game changers. For me, all the hard work it took and still takes to be successful and maintain that success is the biggest challenge. It’s a lot of work, so you better love what you do. So let’s switch gears a bit and go into the Salon Snob story. Tell us more about the business. Salon Snob is a private boutique salon that caters to one on one beauty services. The concept behind my salon is to truly take care of every client that sits in the beauty chair. As a beauty designer, for me personally, its more than just performing hair and makeup services, it’s about how I can make that individual feel on the inside. It’s important for me to have a good relationship with every client, since a trustful bond between the two, truly makes for a great experience overall. At the Salon, we try to make each client feel special, because they are special. With this we create an ambiance of relaxation or fun. Whichever mood the client may be in depicts this. It’s very customizing to each individual. We like our clients to feel like they are being invited into our Salon Snob home as oppose to the traditional factory salon environment. There’s something to be said about this. Clients truly love and appreciate the love and attention we provide in order to cater to all the fine details of their service and experience. At Salon Snob, we are a team. We are never competing with one another and we consistently learn from each other. We work together and have tons of fun! This is how it should be. A fun, relaxing and talented environment…Salon Snob. It’s not about luck for me in my career. It’s about hard work, dedication, appreciation and always staying humble. These are true ingredients to success. Some may say that luck is being in the right place at the right time. However, my right place at my right time is what I have achieved. All of my achievements and accomplishments I’ve earned through my hard work. I would say I’m blessed, rather than lucky. Wow… Okay where do I begin!!!! My name is Shaina Woody. Jordyn is a dear friend of mine.. we grew up in our high school years together! 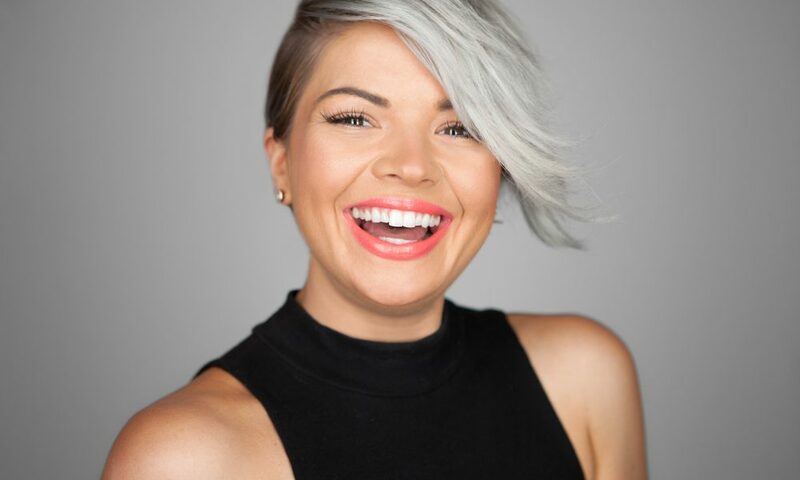 When I met Jordyn at age 16 I have seen her from the very start in the salon industry… Always working super hard after school never having extra time for play. I have seen first hand the hard work this woman has put into becoming who she is and what she has accomplished today in beauty! Always wanting to do my makeup for me… My hair… Lol was great having a friend who actually know what they were doing… She really taught me how to beautify myself cause I sure didn’t… Having two older bothers consisted more of tree climbing and video games rather than beauty secrets and facial masks!!! Jordyn drive and desire to want to make people not only look good but feel beautiful has always came from her heart..